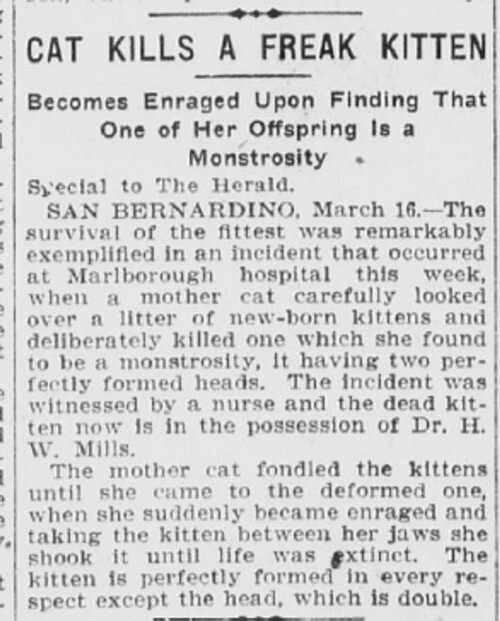 Los Angeles Herald, March 17, 1906. Sure, having two heads probably isn't so adaptive, but no, this really doesn't remarkably exemplify "survival of the fittest," which anyway is a crap phrase that does more harm than good in conveying the fundamentals of natural selection. Moreover, maternal infanticide is actually pretty common among cats, even when the offspring in question are your standard, single-head models. Not to say this isn't a totally newsworthy item. Today, we have footage of water-skiing squirrels to round out the weather forecast; back in the day, they had wire-service items about cats killing their freak kittens to pad out the paper. Only the tone has changed, really.